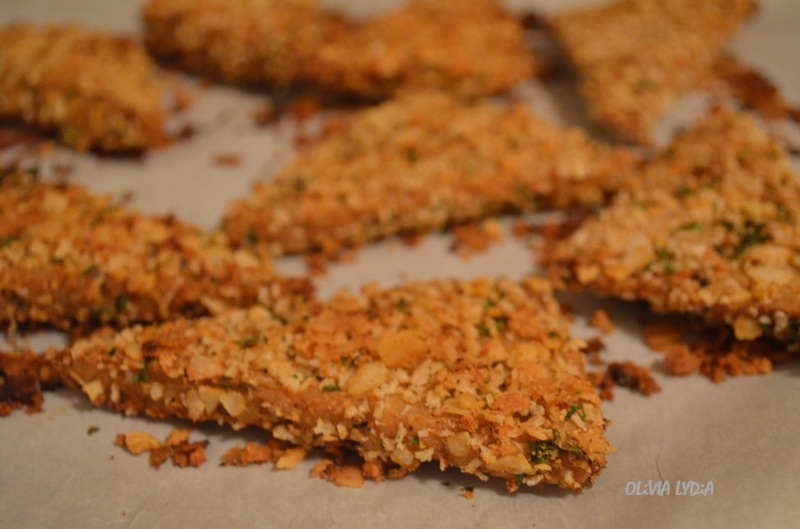 Crispy BBQ Coco-Breaded Tempeh – Olive For Greens. This is a great dinner recipe! 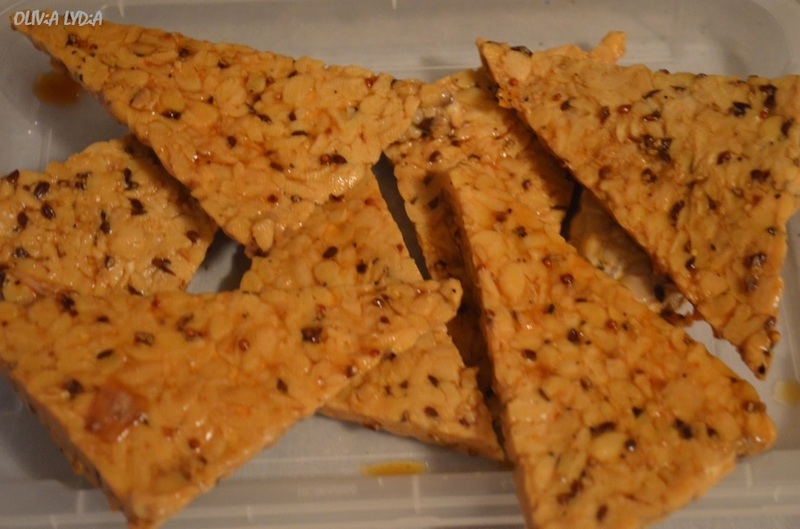 The protein in the tempeh is a great source to get amino acids (what protein is made up of). And come on, who doesn’t love BBQ!?! This can be paired with a crisp green salad (click here for salad pairing idea) or lightly stemmed green beans! Below are 3 easy steps to bringing this dish together- BBQ sauce recipe, breadcrumb recipe and marinade. This may look like an overwhelming amount of steps but it’s not what it looks like! I wrote out specific instructions to make it as easy as possible. Really, this is quite simple! I love sauces! I am the kind of person who would rather dip their food in sauce than have it dredged in sauce. It’s just a thing. 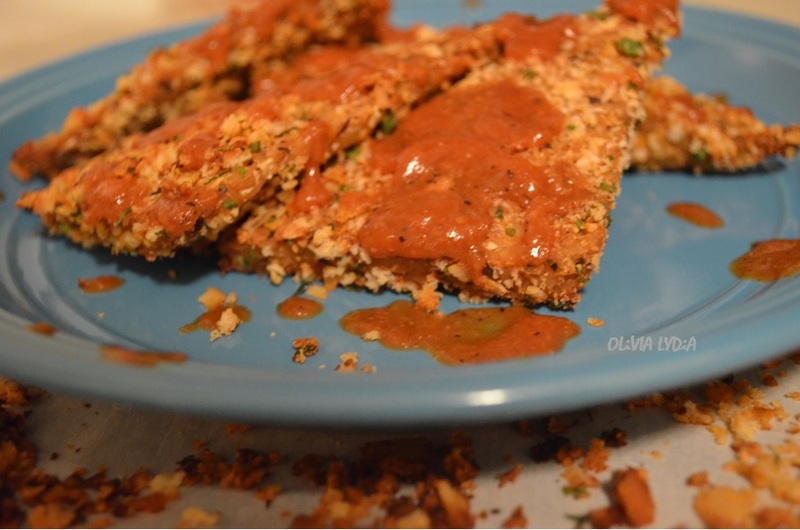 You can dredged your baked tempeh, lightly drizzle the sauce on them or dip these in the BBQ sauce. All options on the table! I created a homemade BBQ sauce because, well, store brought usually has things in it I worry about. 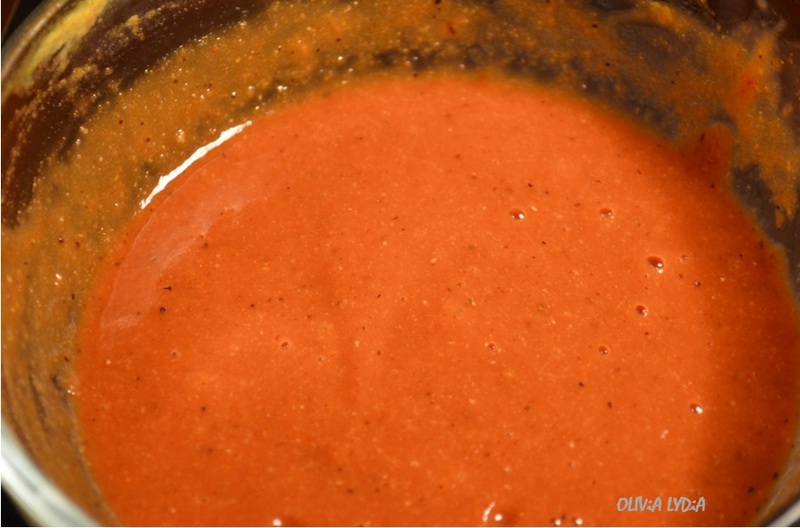 This BBQ sauce is really simple to make and tasty! Seriously, I surprised myself. Note: The tamari plays as a salt in the sauce but feel free to add salt to taste. TIP: Why Organic Ketchup?!?! Because all ingredients are organic & above all no fructose corn syrup!! Whisk all of the ingredients in a bowl. Refrigerate until ready for use. 5 minutes before the tempeh is done baking (instructions below) simmer in a small pot. Marinating the tempeh (pronounced TEM-PAY) is important because all of the flavors soak in and give the tempeh more flavor. Think about it like marinating chicken or steak (for you meat eaters). For those who have never had tempeh, its virtually tasteless- which is a good thing because you can make it taste like whatever you want! Also listed in this step is how to cut the tempeh (in case you’ve never worked with this before). Note#1: I used a small piece of fresh onion chopped instead of granulated onion powder this time. I find granulated is easier to handle. Either option is fine! Note #2: My tempeh has flax, in case you are wondering about the dark brown flecks. Add the marinade ingredients to a zip-lock freezer bag. A. 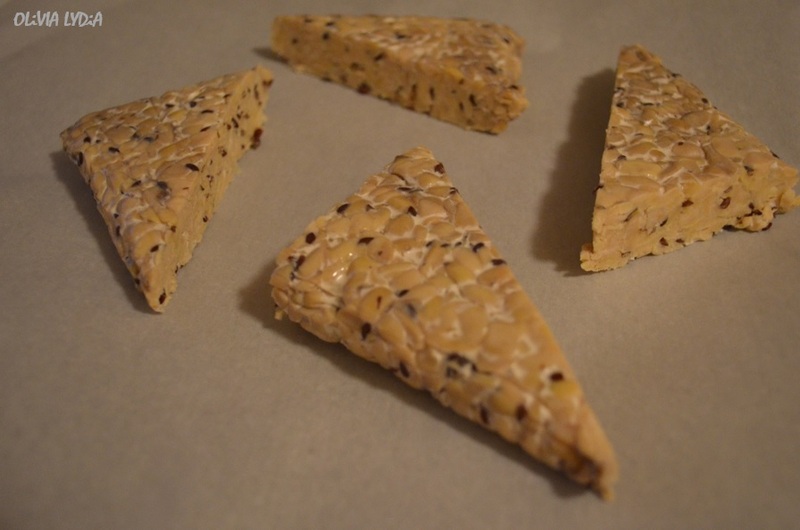 Cut the tempeh through the center widthwise-You will have 2 pieces in front of you. B. Slice each half corner to corner into triangle- You will have 4 pieces in front of you (pictured below). 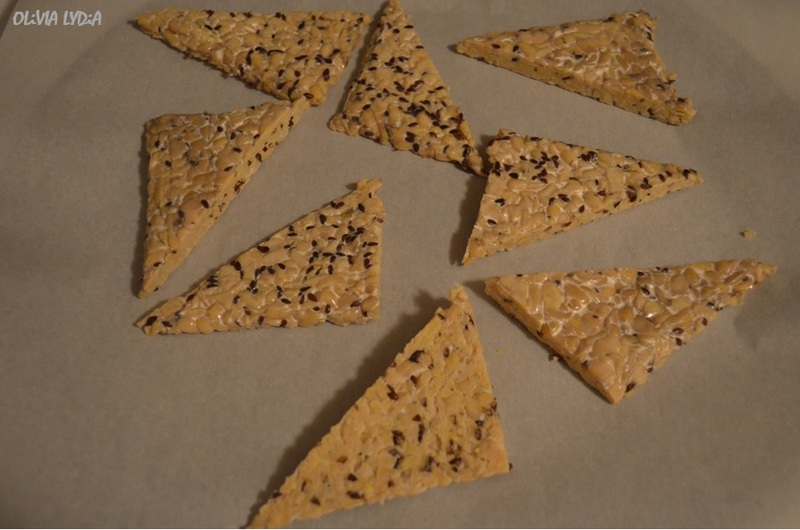 C. Finally, cut the tempeh thinner by standing a triangle up and slice it in half- You will have 8 pieces in front of you (pictured below). 3. Gently, add the tempeh to the marinade, seal the bag and refrigerate for at least 20 minutes. Meanwhile, prepare the Bread crumb. Yes, this breading has coconut in it. No, you do not have to use if you do not like it or do not have any. Don’t worry, it will still taste yummy! Simply add all of the other ingredients in a bowl- skipping steps 2-4. Also, don’t be intimidated by the old bay season. There is no trace of seafood in it what so ever. In fact, it’s vegan (read the label if you don’t believe me)! Note: I used “Let’s Do Organic” Coconut flakes (pictured below). Tip: Yes, there are gluten-free panko bread crumbs. In a shallow bowl add all of the ingredients except the coconut. 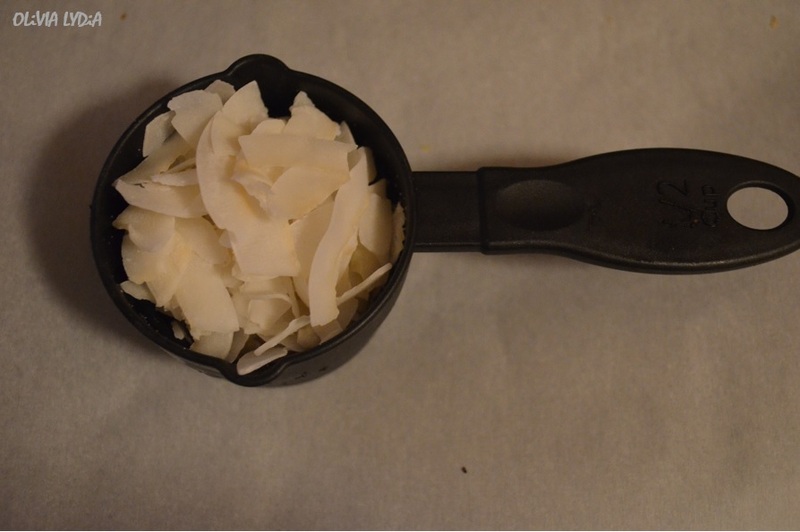 If you have smaller flakes of coconut skip steps 2-4 (see picture below for flake size I used). Measure ½ cup of coconut flakes. 3. 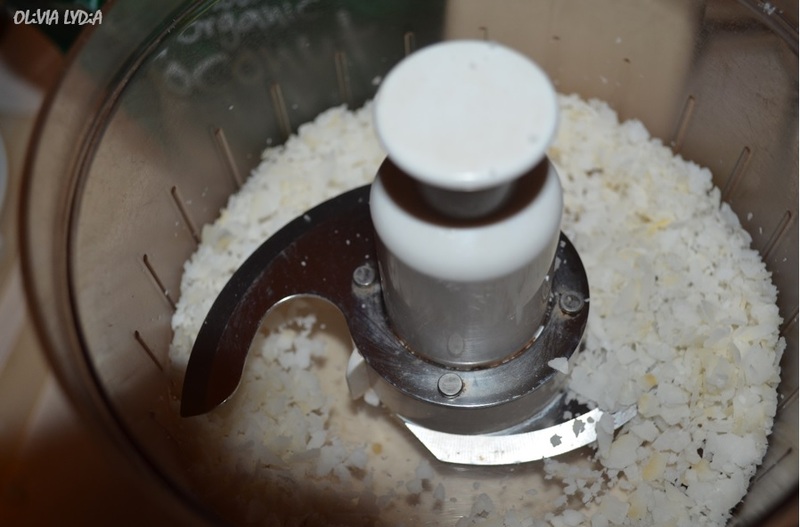 Place in a food processor and blend for a few seconds- careful not to turn it into dust. 4. 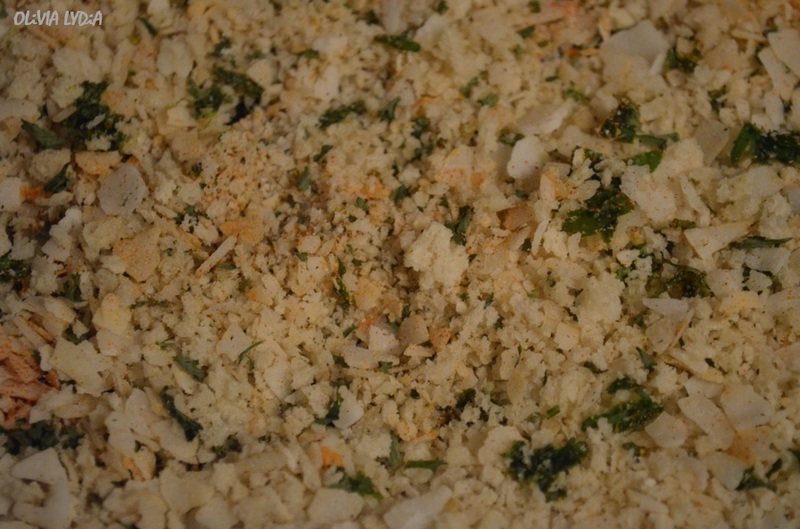 Finally, add the coconut to the breadcrumb mixture. Set aside. Breaded tempeh before it was baked. One at a time, while the tempeh is moist, bread the tempeh- gently rub the tempeh into the bread crumb. 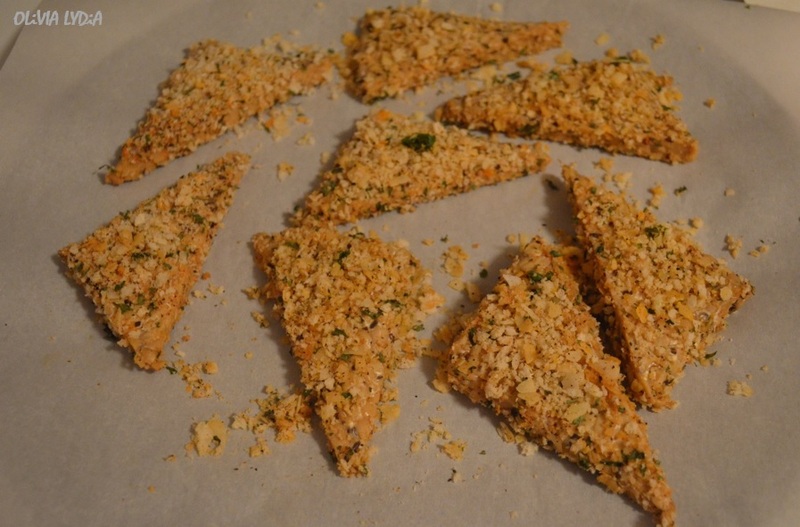 Once all of the tempeh is breaded, you can sprinkle (or push) breadcrumb on top of the tempeh. Bake for 15 minutes then flip (Reminder! Don’t forget to heat the BBQ Sauce) and bake for 5-10 minutes more on the other side. Next Post So You Think You Know Protein? Pingback: So You Think You Know Protein? | OliveforGreens! 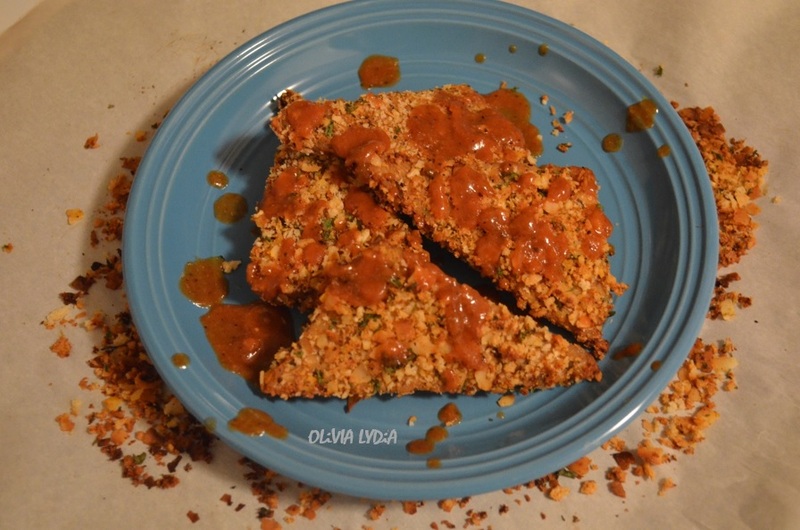 Pingback: BBQ Cauli-Chick’n Bites – Olive For Greens.